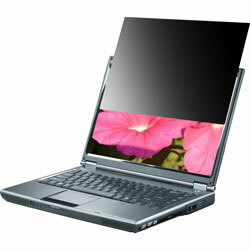 Privacy filter for notebooks blacks out image to prevent unauthorized viewing from the side. Helps ensure the privacy of on-screen data on your notebook. Image is only visible to those directly in front of the screen. Side view is black. Frameless filter overlays LCD surface for a built-in look. Protects LCD surface from damage. Notebook computer can be closed while filter remains attached.